The value of things taken out of their origin is the value that we choose to place on them. In our global age, with instant communication and almost as quick travel, our fascination with foreign things is fueled by our ability to control how we value them. But what is the value of things in their origin? My origin is Sidwell Friends School in Washington, DC. I spent 13 years as a student at Sidwell. I was a lifer with an asterisk. I had left for one year after middle school because middle school was terrible for me. Still I came back to Sidwell and graduated from high school in 2007. Recently I returned home. I went right to where I first left, the middle school -- now with a wonderful new administration -- and without knowing it, I found out my value. Liz and Branson with Kimberly and her sixth grade students at Sidwell Friends School after completing the scarves and video messages that will be exchanged with students in Ghana. My team and I spent three days with Kimberly Clarkson's sixth grade homeroom class talking about far away places. 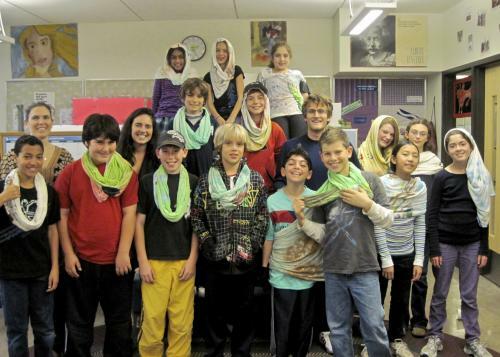 Our project is to facilitate relationships between students at Sidwell with students in Labadi Town, Accra, Ghana, West Africa through scarves that they create and exchange. We talked a lot about Ghana. We showed the students videos of the transportation system, we passed around the cell phone top up cards, they read a Ghanaian newspaper, and even had a little taste of the food. This could have been another classroom moment soon to blend into long forgotten memories of readings, numbers and social studies homework. It could have been entertainment for the children used to Smart Board lectures and prestigious speakers. But it was a whole lot more. Many of the students engaged in the discussion and opened themselves up through creativity in a way I can't remember ever doing. As we talked about fair trade practices, they researched labor standards in the apparel industry. Some students even emailed major apparel manufacturers asking about the companies' production policies. They found their way onto web pages talking about polemical child labor and human rights abuses in the Uzbek cotton industry. The students came to see the deep complexity of these issues. At every step they dissected legal-jargoned email responses and PR-filled websites with overflowing enthusiasm and dictionary.com at their fingertips. I felt their excitement and I believe they felt mine. The students' engagement in our Circle Connection [since renamed Collectofus] activities was not because they have any significant interest in Ghana. It is because my team and I have been there and I have also once sat exactly where they now do. I don't know how much the children really care about Uzbekistan, but I do know that they want to do something to change the child labor situation there because my team and I are doing something about it through our work. (My partner Liz has biked from London to Paris in support of the Environmental Justice Foundation's work to change the cotton industry!) No one is the perfect role model. That's not my point. But the things we do and the relationships we build through the places we've been and the things we exchange tie us together and inspire us in ways that few statistics or lectures ever could. Mrs. Clarkson's sixth grade students eagerly dissect the language of production standards. The Circle Connection is a hands-on approach to learning through which students look as much at global issues as they do at their own role on an individual scale. I went home to discover that my value is the place I'm from and what I've done in the places I've been. After 13 years of sitting in Quaker meetings at Sidwell Friends School, I hold one Quaker tenant especially dear: Let Your Life Speak. I am so fortunate that the place I am from has provided me the opportunity and has pushed me to let my life speak. I am equally as grateful that Mrs. Clarkson's sixth graders listened and spoke with me. I don't believe the students will soon forget our conversations. I certainly won't, at least. After all, when I first ran away from middle school, this time I didn't want to leave.